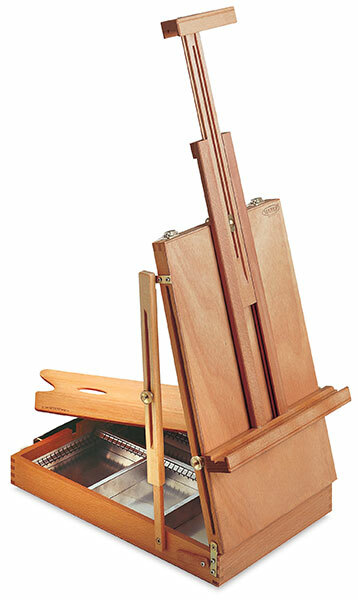 Constructed of oiled, stain-resistant beechwood, the Mabef M-24 sketchbox table easel features a canvas holder that can be adjusted to any vertical or horizontal angle, and lockable side supports for stability. The interior has removable dividers that allow artists to configure the space in a variety of ways. An oiled beechwood palette fits inside. The M-24 holds canvases up to 30¼" high, up to a maximum weight of 17.5 lb. It measures 30¼"H × 12"W × 17¾"D when fully extended, and 19¾"H × 13"W × 5"D when folded. It weighs 6.5 lb.